The failed immigration of tenant farmers, or crofters, from the Scottish Highlands to the Sandhills region of eastern North Carolina in 1884 is one of the most peculiar instances of European immigration in the state's history. 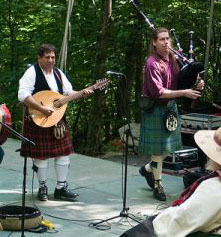 Scottish Americans residing in the area of present-day Scotland, Richmond, Hoke, Moore, Robeson, and Cumberland Counties were inspired to organize a scheme to introduce up to 350 Scottish Highland crofters into the old Highland settlement in the early 1880s. They launched the scheme after hearing of the extreme oppression experienced by these small landholders at the hands of their landlords and factors in their homeland and the organized resistance and rent strikes that began on the Isle of Skye in 1882. Worldwide attention was drawn to that region by a small skirmish between tenants and police known as the Battle of the Braes, which served as the beginning of popular uprisings throughout the Highlands against oppressive land tenure policies. Several of the crofters prominently involved in this event were among the parties that settled for a short time in North Carolina. The plan, organized by Highlander Margaret MacLeod and others in Scotland, aimed to remove groups of crofters from their holdings on the Isles of Skye and Lewis, as well as other regions of the Scottish Highlands, and relocate them to the established Highland settlement of North Carolina. North Carolina's Highland settlement was thought to be an ideal home for these immigrants as it was expected that the established Scottish American families would foster the successful assimilation of the newly arrived Highland crofters. Private funds were collected for the scheme on both sides of the Atlantic; the North Carolina Bureau of Immigration, under the leadership of John T. Patrick, and the Seaboard Air Line Railway also contributed substantially to the effort. Local efforts were steered by James L. Cooley of Wagram. Unknown to the immigrants, Lord MacDonald and other prominent Highland landlords secretly contributed to the efforts as a means of ridding themselves of some of the land reform agitators and superfluous tenants. The first group of crofters, numbering 73, arrived in North Carolina via Norfolk in March 1884 and was transported to Laurinburg under the care of Cooley and D. P. McEachern. From there the crofters dispersed throughout the community, as arranged by their sponsors. A second group arrived in May, and its 65 members were transported to the vicinity of Cameron under the care of Cooley and Frank W. Clark of the Seaboard Railway. Additional small parties arrived in Richmond County throughout the spring. Newspaper accounts touted the success of the immigration and spoke of the possibility of additional large parties that would arrive in coming months. Upon arrival, however, the immigrants found that the promises of free land and employment held forth by MacLeod and others were not true. By July some newspapers reported dissatisfaction and unemployment among the crofters. It became apparent that many of these immigrants lacked the skills necessary to integrate into agricultural pursuits immediately and that many of the families were further handicapped by the fact that they spoke only Gaelic. There is also evidence that the host families had taken advantage of the opportunity for an ethnically attractive labor force, and that their sponsorship of the crofters had not been entirely humanitarian. Two of the crofters returned to Scotland in early July and reported to newspapers that "where work was obtained the only wages given was the bare food, and the houses provided were the small one-roomed huts formerly occupied by slaves." By the fall of 1884 most of the crofters had made efforts to return to Scotland or relocate to other areas in the United States. Most of the immigrants eventually did return to their homeland, feeling deceived by the organizers and dissatisfied with their experiences in North Carolina. Newspapers of the day show that the crofters themselves were forced to bear most of the blame for the failure of the plan, although the reputation of state immigration agent John T. Patrick was severely tarnished by his association with the affair. As a result, the state did not engage in any further recruitment schemes for foreign immigrants in the late nineteenth century. Only a handful of crofters remained in North Carolina, most being young men employed as farm overseers or in similar pursuits. One of the most notable families that remained was that of Alexander MacRae. After failing at agricultural efforts in Moore and Robeson Counties, MacRae was employed by businessman Hugh MacRae of Wilmington, who sent him to present-day Avery County to serve as foreman in building the Yonahlossee Turnpike between the new resort village of Linville and the town of Blowing Rock. MacRae and his family operated a guest house for tourists on what is now known as MacRae Meadow near Linville. This site would later become the location of one of the world's largest Scottish gatherings-the Highland Games at Grandfather Mountain. Rowland T. Berthoff, British Immigrants in Industrial America (1953). Highland Games at MacRae Meadows. Image courtesy of Flickr user AMWRanes. Available from http://www.flickr.com/photos/awelch/4238017908/ (accessed August 15, 2012). 1 January 2006 | Caudill, William S.